I used my new MFT stamp sets - NBUS (never before used schtuff), as Darnell from djcardkreations would call it. By the way - she has a challenge going on over there for exactly that - get your NBUS out there - you bought it to USE it, right? Stamped in various colors and added some black paper strips on the side - to combine the colors with the sketch. Colored in the "YOU" and added those lovely enamel dots. I am also linking this card with Seize the Birthday - option summer - I think those colors are really summery! You did an amazing job on this card, Cornelia! I'm in awe as to how you stamped those chevrons so perfectly...WOW! And, I love the bold colors and your 'play on words' for your sentiment! This is such a fun card! FABULOUS!!!! What a card Miss Cornelia, I love those bright colors and so perfect for a birthday. 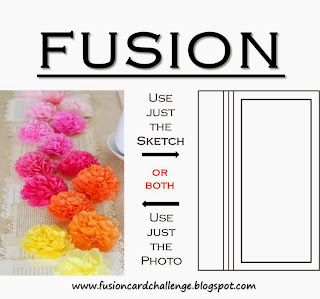 You ROCKED the Fusion Challenge Cornelia! Nicely executed. Fabulous. Great design, great colours and great stamp! Boah das haut mich um !!! wonderful card love the colorful chevron too! Thank you for your participation to our Challenge. awesome card, Cornelia...love those bright cheery chevrons and that sentiment is so clever too! thank you for linking this card up to Seize the Birthday! So bold and fabulous! Such a striking design. Thanks for playing along with Seize the Birthday! love your design with the different chevrons- awesome! Thank you for coming and sharing with us at FUSION!!!!!!!!!!!!!!!! Die sieht echt klasse aus!! Tolle Farbkombi!